Firstly, a brief outline of what causes gout. 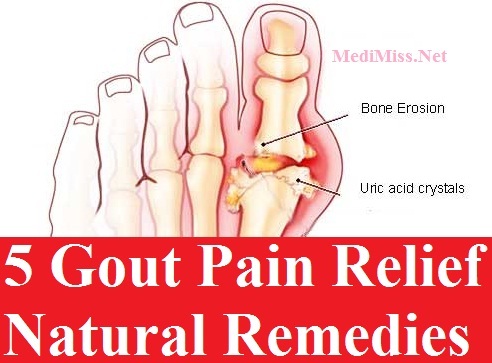 In essence gout is caused by the build up of uric acid crystals in the blood that are then deposited in the joints and soft tissues surrounding the joints. Uric acid naturally occurs in our bodies, the problems start when there is excessive levels present. - It's can be down to a hereditary condition whereby your body struggles to process uric acid efficiently. - Your diet is high in purine-rich foods. Purine, when metabolized, produces uric acid, so if you're eating lots of purine-rich foods the body struggles to expel the resulting high levels of uric acid. - Some medications can lead to increased levels of uric acid. - Impaired kidney function can hinder the process of eliminating uric acid in via the urine. 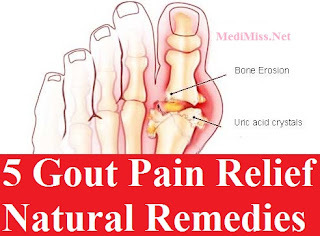 There are a number of gout pain relief natural remedies that you can use to reduce the swelling and relieve the pain of a gout flare-up. The simplest of the home remedies is water. We all know that we're supposed to drink 6 - 8 eight ounce glasses of water a day, but we don't all do it! However, as a gout sufferer it is vitally important to keep your fluid intake up. Keeping the body hydrated dilutes the uric acid and allows it to be easily processed by the kidneys and eliminated in the urine. If drinking that much water isn't very appetizing to you then fruit juices and tea are okay alternatives. But try to drink as much pure water as you can. When you have a gout flare up a great way to reduce the swelling and accompanying pain is to ice the area. Keeping a cold compress pack in the freezer makes this an easy task when gout strikes. Conversely, other gout sufferers report experiencing relief when keeping the affected area warm. Try wrapping a warm towel around the joint or applying a warm wheat bag to the area. This can help to alleviate the pain and many gout sufferers say it's a good way to help you get to sleep. changing your diet is a longer-term remedy. It won't bring you immediate relief, but it will reduce the uric acid in your system over time and help prevent further attacks. 1950 was the year that cherries were discovered to bring relief from gout symptoms. Furthermore, recent studies on the anti-inflammatory properties of cherries have produced similar positive effects. Cherry juice is not a drug and therefore has not been submitted to the clinical trials that medications have, however, many gout sufferers have found relief from their gout symptoms while drinking or taking cherry juice or extract. Thanks for sharing old natural home remedies for <a href="http://www.canadiandrugsaver.com/anti-gout/zyloprim_173.html>gout treatment</a>!